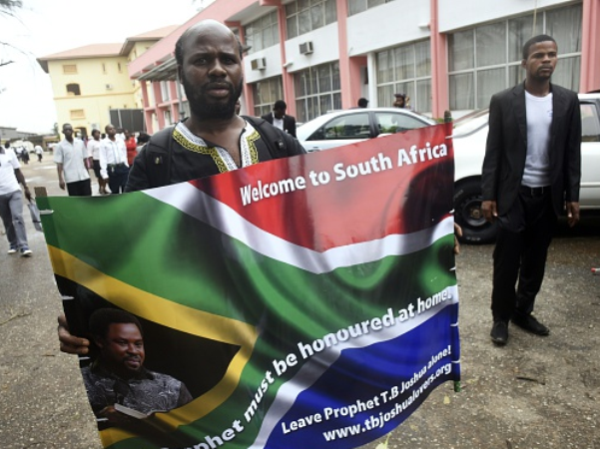 The remains of the 85 people from South Africa who died when a church building collapsed in Nigeria will be repatriated at the weekend, Minister in the Presidency Jeff Radebe said on Tuesday night. "If everything goes well, we will repatriate this coming weekend," Radebe said. Radebe, the special envoy to Nigeria, was speaking at a media briefing in Lagos on Tuesday night. A guest house belonging to the Synagogue Church Of All Nations in Lagos, headed by preacher TB Joshua, collapsed on September 12, killing 116 people. These included 81 South Africans, as well as three Zimbabweans and one Democratic Republic of Congo national using South African travel papers. Radebe told the media briefing: "Since yesterday, we paid a courtesy visit to the President of Nigeria his Excellency President Goodluck Jonathan to convey the message from our President Jacob Zuma about the need to speeding up the process of repatriating 81 South Africans who perished on this tragic event. "We are happy to indicate that the President of the Federal Republic of Nigeria, not only is he committed, but he has on several occasion been in communication with our President indicating their full support to ensure that as soon as possible we can be able to repatriate those 81 South Africans including the four who were also carrying South African passports. "We are confident that after that discussion we are going to be seeing progress towards finalising this very traumatic experience. "As soon as we get a green light, we will repatriate. Our infrastructure is ready; the aircraft to transport our compatriots is also ready. If everything goes well we should be able to repatriate them this coming Saturday in order to arrive in South Africa on Sunday," said Radebe. He underlined that South Africans were in mourning. "In terms of our culture we normally bury the deceased within a week. Tomorrow it will be two months since the tragic event took place. "This has been extraordinarily a long time for these families, for them to receive the remains of their loved ones. We also acknowledge the patience of these families during this difficult time. "They have had to endure the pain, suffering and emotions of the endless wait. We hope that this weekend these families will be able to have closure to this very tragic event." Radebe said many South Africans were in Lagos supporting the repatriation process, including medical officers from the department of health, the SA Police Service, and the SA National Defence Force "in order to ensure that we give full co-operation to wrapping up this tragic event".